(Route 604) on the east, Route 517 on the west, and Cranberry Lake (Route 206) on the north. The Musconetcong River, with some of the best trout fishing in the state, winds through Allamuchy Mountain State Park. Several miles of trails crisscross through the forests and marshlands of the park. Allamuchy Mountain State Park has very limited access for people with disabilities. There is a boat launch and dock at Cranberry Lake that can accommodate persons with disabilities. Please contact the park office for further information regarding disability access needs. Text telephone (TT) users, call the New Jersey Relay Service at (800) 852-7899. Open daily sunrise to sunset. The mature mixed oak and hardwood forests and numerous maintained old fields of this natural area display various stages of succession and forest development. Many trails traverse the natural area and provide access to scenic Deer Park Pond, which is centrally located within the area. There are more than 14 miles of marked trails available for hiking, mountain biking and horseback riding in the Allamuchy Natural Area. 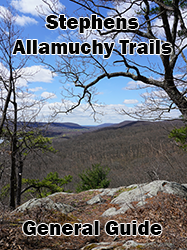 There also are more than 20 miles of unmarked trails available for hiking, mountain biking and horseback riding in the Northern Section of Allamuchy Mountain State Park. A 3 mile section of the Sussex Branch Trail starts at Waterloo Road and goes northwest to Cranberry Lake. Using an old railroad bed, this trail provides the hikers, mountain bikers and horseback riders easy access from Waterloo Road through Kittatinny Valley State Park to Branchville, New Jersey. 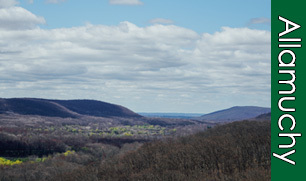 A 10 mile section of the Highlands Trail goes from the northern boundary of Allamuchy Mt. State Park off Route 206 through Stephens State Park. The difficulty of the trails range from moderate to rugged. A 3 mile water trail on the Musconetcong River is available for canoes, kayaks and rowboats. The trail is between Waterloo Road at Route 80 and the Saxton Falls Dam. Allamuchy Mountain State Park provides excellent fishing opportunities year round. During the spring the Division of Fish and Wildlife stock the Musconetcong with brown, rainbow and brook trout. Cranberry Lake, Jefferson Lake, Allamuchy Pond and Deer Park Pond contain warm water species such as large mouth bass, sunfish, perch and pickerel. In May 17, 2014, the NJ Division of Fish and Wildlife began stocking landlocked salmon in Tilcon Lake to provide anglers with an opportunity to fish for this unique coldwater sport fish close to home. Only a handful of deep lakes in New Jersey have suitable year round habitat for coldwater fish like trout and salmon. Lake Wawayanda in Wawayanda State Park and Lake Aeroflex in Kittatinny Valley State Park are also stocked with salmon. Tilcon lake can be accessed by parking at the entrance on Kinney Road (named Kennedy Rd. in Google Maps, and which intersects Rt. 604 south of I-80). From the entrance it is a short walk (300 yards over level ground) to the lake. Parts of Allamuchy Mountain State Park are open for hunting. The Allamuchy Natural Area is available for deer and small game hunting. Hunting is subject to New Jersey Division of Fish and Wildlife regulations. The Rock Climbing area is located near Waterloo Village on Waterloo Road A waiver is Required. Contact park office for specific information. All picnic facilities are available at nearby Stephens State Park including: picnic tables, group picnic facilities, a group picnic shelter, and playgrounds. A public boat launch is available at Cranberry Lake. All types of boats: electric motors, gas motors and canoes can launch between sunrise and sunset year round. Each person must have on a wearable Coast Guard approved Personal Floatation Device (PFD). Alcoholic beverages are prohibited. Can I camp at Allamuchy Mountain State Park? There are family campsites available at nearby Stephens State Park from April 1st through October 31st. 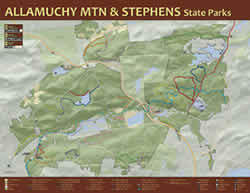 Can I use an ATV or off road motorcycle at Allamuchy Mountain State Park? Use of ATV and off road motorcycles is prohibited.